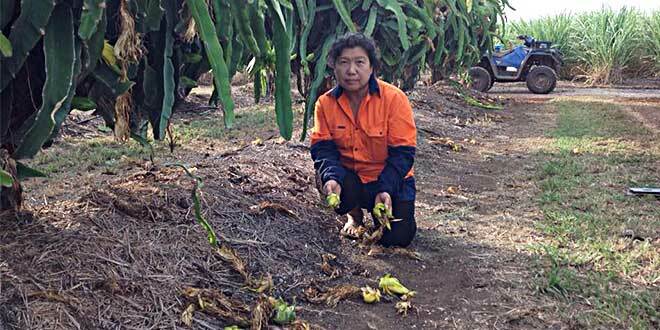 Drought: Carol Wallace is praying for rain on their farm near Bundaberg. IN drought-stricken Childers, the Catholic faithful have been praying for rain – and it’s working. Each Monday afternoon for the past five weeks, Carmelites of Mary Immaculate Father Sunny Mathew has joined his parishioners in prayer in the town’s Sacred Heart Church. On March 14, substantial rain fell for the first time in three months – drenching farms and cattle properties. It wasn’t enough to break the drought, but it was a welcome start. “By the grace of God we got rain,” Fr Mathew, who had just driven 56km from another parish church in Gin Gin, and noted new shoots of green grass rising from the parched, cracked soil, said. Three Childers parishioners – Peter Vella, Anthony Russo and Angelo La Rocca – all farmers, lead the weekly prayers for rain. “If we didn’t have faith we wouldn’t be doing it,” Mr La Rocca, whose family first bought a farm near Childers in 1915, said. On Saturday, March 18, Childers parishioners held a public-square prayer meeting outside their church, attended by dozens of people. “During the meeting we had a clear blue sky and it was very hot, but then in the afternoon the clouds came over and we got a good drop,” Mr La Rocca said. “We’ve had 111mm in the last week or so, but we need plenty of follow-up. “We’ll keep praying for rain and we are determined that when we have our prayers answered we’ll also have a ‘thank you’ Mass as well. Sharron Russo, who attends the prayers for rain with her husband Anthony, reported patchy rainfall on their cattle property at South Isis, 6km outside Childers. “Every drop of it is welcome, but the dams are still very low,” she said. In a predominantly farming community, Fr Mathew said he always started his Sunday Mass with a direct petition on behalf of his parishioners: “Let us have hope and faith and trust in the Lord. Let us pray for rain”. “Those who come have to always depend on God’s promise and trust that God will do according to his will,” he said. Further north, Bundaberg parish priest Fr John Daly said the town had experienced the hottest months since the 1800s. “The news has only just come through that we are drought-stricken,” he said. Farmers around the region, like Bruce and Carol Wallace, who cultivate sugar cane and dragon fruit, are irrigating to keep crops alive while they pray for rain. Local cane farmers have used almost all of the water allocation supposed to last until June. The Bundaberg region has been officially drought-declared since March 1, which brings the area of Queensland that is drought-declared to 84.29 per cent. Drought-declared producers can access fodder and water freight subsidies and emergency water infrastructure rebates. The assistance package includes relief from electricity charges, land rent rebates, water licence waivers and mental health packages. “The cane crop is dramatically reduced. The dragon fruit is reduced. The district hopes for two million tonnes of sugar cane; if they get 1.7 that will be a miracle,” Mr Wallace said.